Visual Studio Code>Other>Project TemplatesNew to Visual Studio Code? Get it now. Visual Studio code extension that allows you to quickly create new projects based on custom templates. Inspired by this File Templates Extension, which is itself inspired by a similar Atom Extension. In Visual Studio code, Press F1 to open the command menu and type ext install cantonios.project-templates. See CHANGELOG for release notes. Extension commands can be executed from the Command Palette or from the context menu when selecting a folder. 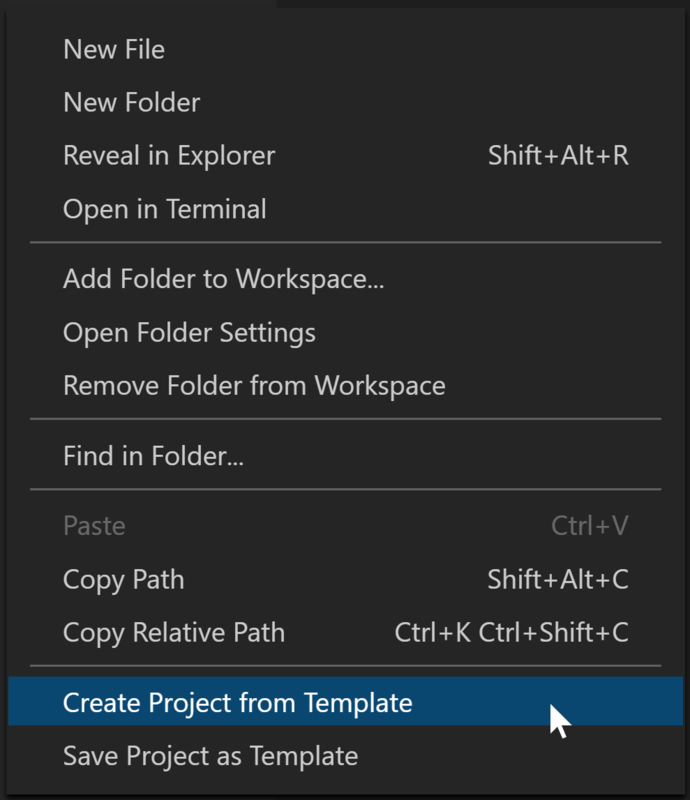 In VSCode, open a folder that will contain your new project. Use the Command Palette to execute the command "Project: Create Project From Template". A list of available templates should appear. Select the desired template. The contents of the template will be copied to the current root workspace directory. If called from the context menu, the contents of the template will instead be copied to the selected folder. Create the desired template project in your current root workspace directory. Use the Command Palette to execute the command "Project: Save Project As Template". Enter the name for your template. The contents of your root workspace directory will be copied to a new template folder. If called from the context menu, the contents of the selected folder will be copied to the new template folder. When a file is created from a template containing placeholders, the user is prompted for a value to enter. Placeholders can also be used in filenames. The first capture group in the regular expression is used to idenfity the placeholder key. These placeholders will be replaced without prompting.